Bisogna parlar chiaro e patente, non in modo da soddisfare ai buoni e insieme non dispiacere ai cattivi, e ai cattolici e agli eterodossi. (Ms Bg 5672). 1806: Fr. Bertoni used the same Sermon on the Passion this day that he had preached on April 3, 1801. John Marani was tonsured this day by Bishop Molin. [This Bishop seemed favorable to the French faction in Verona. He was Administrator of the Abbatial Church in Asola. 1824: Fr. Bertoni obtain a Decree of Enrollment for the new Oratory at the Trinita? for the Pastor of that Church, Fr. Peter Palamidese. 1828: Bishop Grasser ordained Francis Benciolini a Sub-Deacon, with the Canonical title of Patrimony being supplied by his Uncle, Fr. Cajetan Benciolini. 1855: John Lenotti received the last two Minor Orders, Exorcist and Acolyte, on this Sitientes Saturday. 1843: Francis Solari left the Congregation after 13 years of service ? the House Chronicle noted: ?May God bless him.? 1851: Fr. Lenotti gave the last of his 200 or more sermons at the Friday devotions at the Stimmate. [There are copies of many of these sermons still retained in the Archives at the Stimmate]. 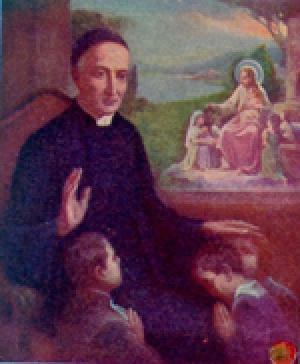 1867: Fr. Marani left the Student House for troubled Verona.